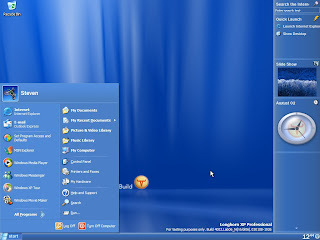 Longhorn had just hit the milestone 4 stretch, DCE had been mostly implemented, the Sidebar was fully functional and it was time to work on the image-based installs; one of the plans for Longhorn was a 15 minute setup (which was pretty much attained looking at the early 4000 builds). 4002 is exceptional in that it is a professional compile in the 4000 range that still uses an XP (i386) setup routine, eschewing the WIM installation format. Unlike later M4 builds, however, 4001 and 4002 both retain the desktop composition engine and effects present in the well-known 3718 build, all easily turned on in the Display control panel. They both include semi-transparent windows, minimize and close animations and full 60fps GPU window compositing - eye candy that would not be seen again publicly until the M6 era.